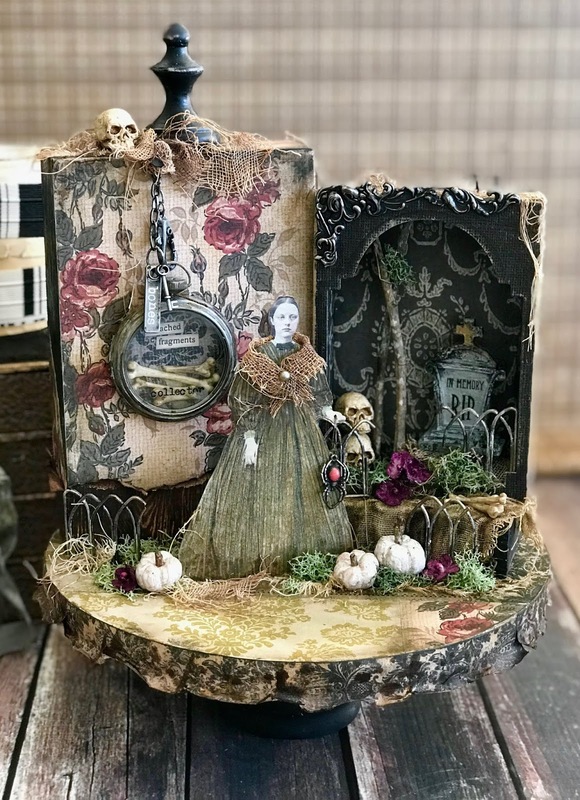 I am kicking off my seasonal projects with a kit for Halloween called Found Objects. I am teaching this class just once on Oct 19th at The Crafty Scrapper along with two Christmas classes. You can call the store directly for information about all three classes. The Found Objects project is an 8” round with a raised pedestal base. The kit has everything you need to complete the project including a package of Halloween Paper Dolls and 12 different Worn Wallpapers for backgrounds. Skulls, bones and pumpkins can be found in the graveyard along with a creepy tombstone and a red-bellied spider. Complete instructions have four color pages of step-out photos + written instructions. A few basic Ranger supplies are needed (that list is included in the kit box). Kit comes delightfully packaged. The Found Objects kit is $89 + 10.95 shipping. This is really cool! Halloween is not my jam, but I know you will sell this out! I finished my kit on Sunday and LOVE it! Thanks again for making it available. Super excited to be taking this class! See you in 6 days! WOW, this is so amazing ( as usual ) love your details... just chalked FULL of inspiration. You are still the found relative and paper doll Queen you know how to bring them to life ! !